As technology changes, sometimes we get stuck on old terminology; we “dial” a phone, the first TV channel is “2″, and we flatten things with a “steamroller”. Most steamrollers today, of course, are gas or diesel powered, but they’re still ’steam’ to us. Steam-power ran most construction machinery in the 19th century, but slowly faded out as modern power systems became reliable. I still call big loaders “steamshovels”, even though they haven’t been steam-powered in a hundred years – but, unlike many other forms of technology, steamshovels took a leap to electricity early on. In fact, a lot of heavy machinery was (and still is) electric, because distance and freedom of movement wasn’t as big a deal, and effectively ‘outsourcing’ power generation reduced weight and complexity. 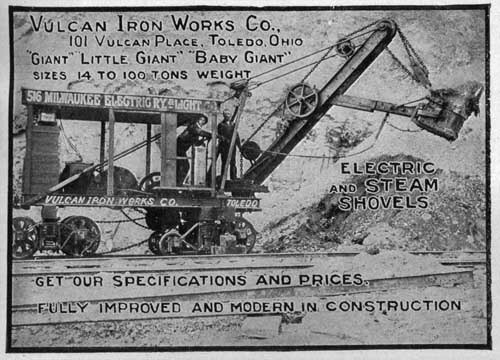 Vulcan Iron Works produced steam shovels since the 1890s, and in this 1905 ad they were showing their steps into The Technology of Tomorrow: Electric Shovels. Vulcan was bought by Bucyrus five years later, and they’re still in making mining equipment today, although under the Caterpillar name. As far as terminology goes, “Electric Shovels” are now known more generically as Power Shovels. In the early 1950s the Garrison Dam was well under construction, and the government was working on accommodating several communities that were about to be soaked by the newly-formed Lake Sakakawea. 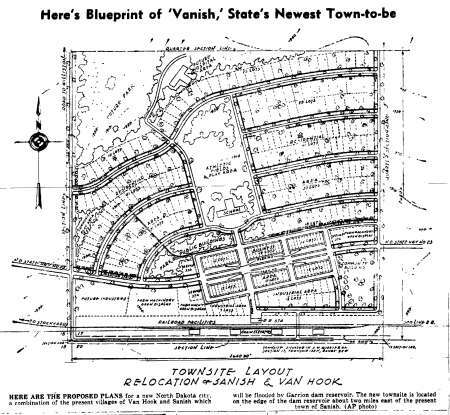 Two villages, Van Hook and Sanish, were only a few miles apart with a little ridge of high land between them, so a new town was platted out in the middle. The media wittily called the new town Vanish, a play on Sanish’s name and its unavoidable fate, but there’s no “Vanish, ND” on the maps today. When you lay the map below over nearby towns to figure out which one this is, you realize that the government was far less witty than the newspapers. The powers-that-be named the new town…New Town. I tried to find a source for this little, not-quite-rhyming poem, that was near the end of my great-grandfather’s WWI memoir, but I came up empty. Turns out that, besides surviving mustard gas and coming back to North Dakota to make a family, he also had a little bit of poet in him. I had a short day at work, so I used my free time on Veteran’s Day to transcribe his entire memoir, which is linked just above. You are currently browsing the The Infomercantile blog archives for November, 2011.